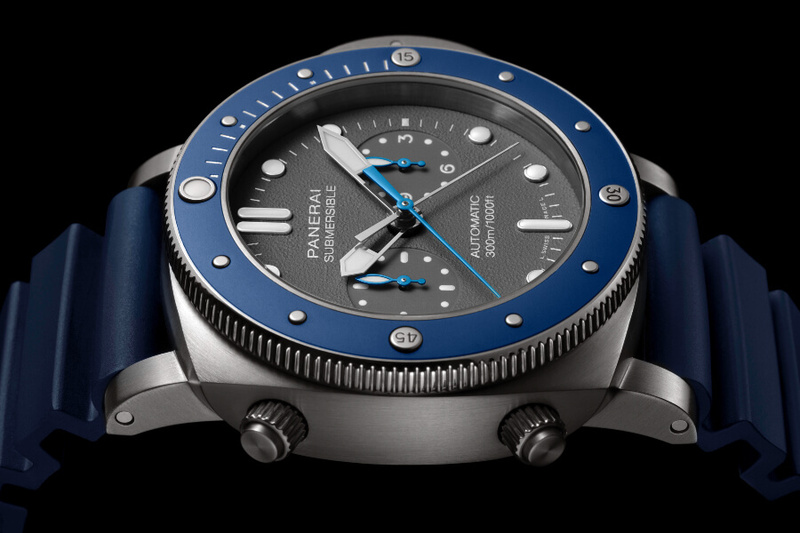 Panerai presents a new diver’s professional watch, strong, bold and tough: a new Submersible chronograph inspired by Guillaume Néry, the french free-diving champion known internationally for the world records he has broken and for his astonishing underwater photographs. The new Panerai Submersible Chrono – Guillaume Néry edition is a combination of performance, strength and reliability worthy of the remarkable champion who has inspired this amazing new creation of mechanical engineering. Guillaume Néry was twice a world champion and he broke four constant weight free-diving world records. This former professional athlete is now an ambassador of the sea, turning his astonishing underwater experiences into images and videos which amaze everyone who sees them. In his honour, Panerai has created a new watch combining technical performance and a remarkably powerful, sporty appearance. 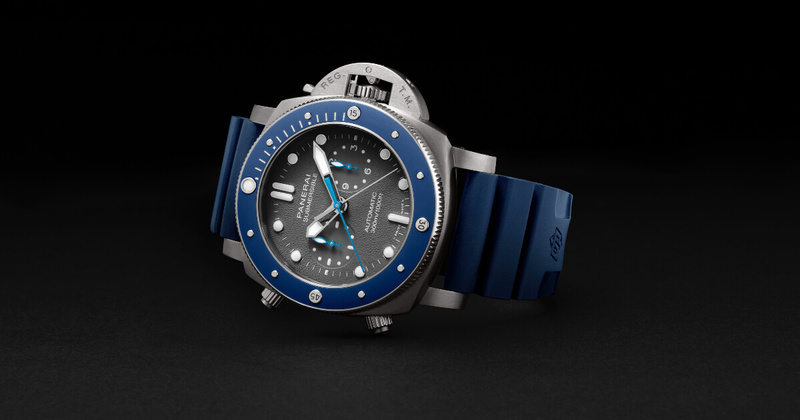 The Panerai Submersible Chrono – Guillaume Néry edition is above all a professional diver’s watch, water-resistant to a depth of about 300 metres (30 bar) and fitted with a unidirectional rotating bezel, which accurately displays the duration of the dive. The dial is clearly legible under all lighting conditions and in complete darkness, thanks to the luminous white markers, which stand out strongly against the shark grey, textured background. Engraved on the screw back are the champion’s signature and the depths of his final awe-inspiring record: 126 metres, achieved with a single breath. The watch is light, with its titanium case which integrates perfectly with the blue of the ceramic disc applied to the bezel, the blue hands and the blue rubber strap. It is also a precision chronograph, with fly-back function and the device for zeroing the seconds hand to enable perfect synchronisation with a reference signal. 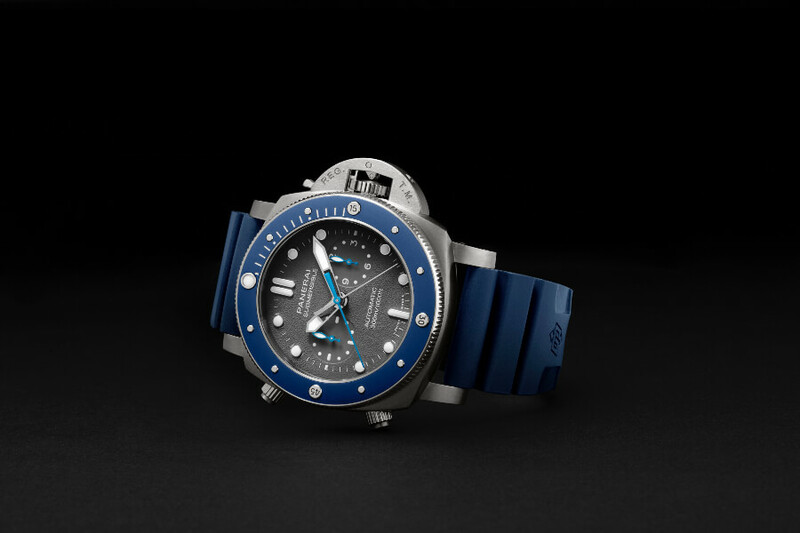 The Panerai Submersible Chrono – Guillaume Néry edition is fitted with a P.9100 automatic calibre with a power reserve of three days. This movement was entirely developed in Panerai’s high quality watchmaking Manufacture in Neuchâtel, in the Laboratorio di Idee where the originality and precision of Panerai watches transform every design into a creation of indomitable character and excellent technical performance. Movement: Automatic mechanical, P.9100 calibre, executed entirely by Panerai. 133⁄4 lignes, 8.15 mm thick, 37 jewels, Glucydur balance, 28,800 alternations/hour. Incabloc anti-shock device, two barrels. Functions: Hours, minutes, small seconds, calculation of immersion time, flyback chronograph, seconds reset. Case: Diameter 47 mm, titanium. Buttons for the chronograph functions at 8 and 10 o’clock. Unidirectional rotating bezel in titanium with applied blue ceramic disc. Back in titanium with special engraving. Device protecting the crown (protected as trademark) in titanium. Dial: Shark grey with applied luminous dots and indexes. Seconds at 9 o’clock, hour counter at 3 o’clock, central chronograph seconds and minutes hands. Crystal: Sapphire, made of corundum, 1.8 mm thick. Anti-reflective coating. Water-Resistance: 30 bar (~ 300 metres). 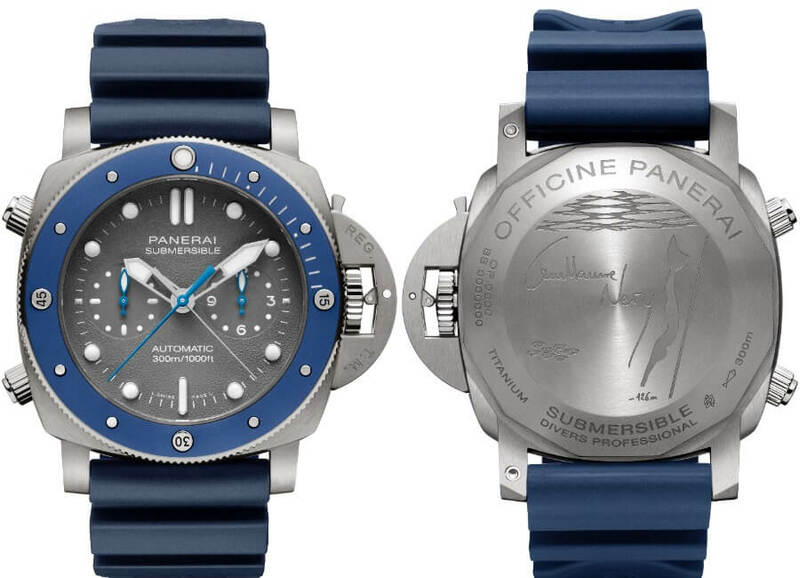 Strap: Panerai personalized blue rubber strap and trapezoidal titanium buckle. 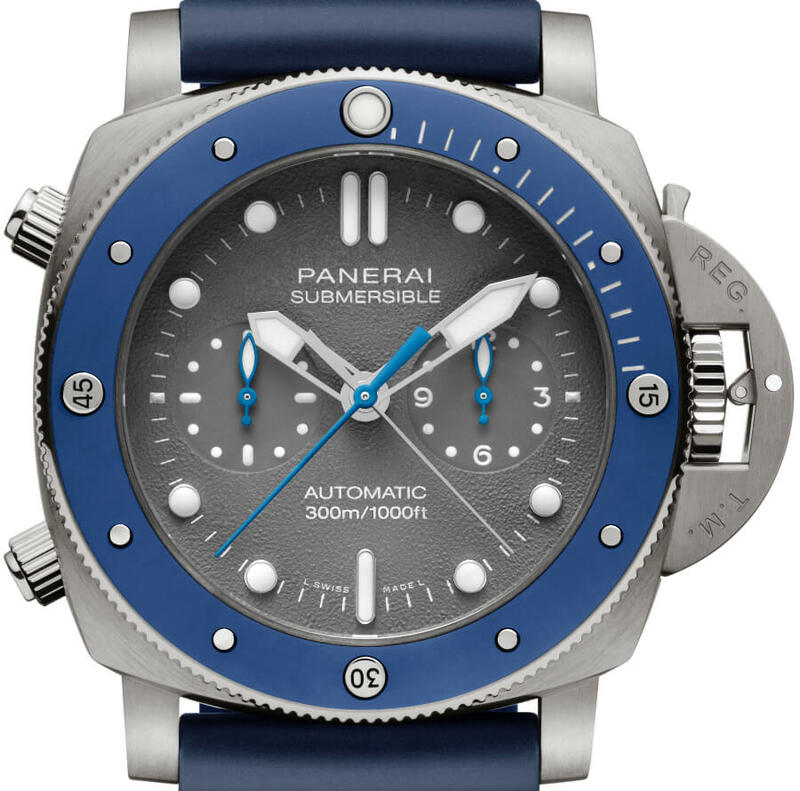 The price for the Panerai Submersible Chrono Guillaume Néry Edition is Euro 18,900. 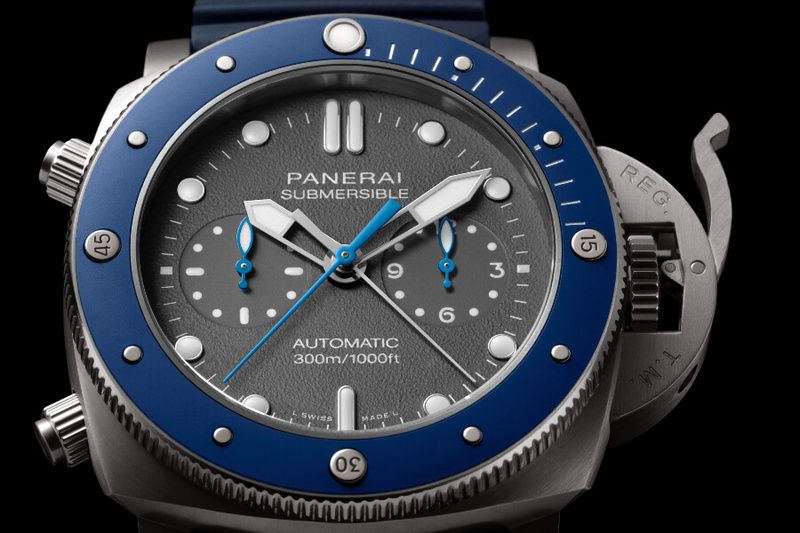 For more information visit Panerai Online.